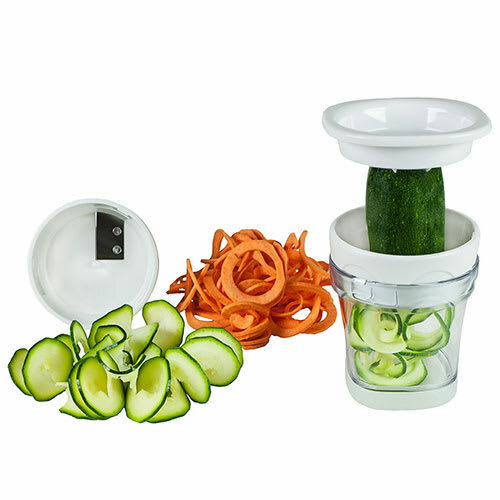 The Paderno A4982801 handheld spiralizer is designed for garnishes and light meals in small-volume operations. It comes with a flat blade for ribbons or spiral cuts and a julienne blade for noodles and continuous strands. The spiked cover pierces into vegetables, holding onto them while the user presses it through the blade. Made of stainless steel, the blades are strong and resistant to rusting, and the other ABS plastic components are corrosion resistant. These pieces are all dishwasher safe and can be assembled together for organized storage.